Pampita Lodge in Beverley sleeps 6 people. 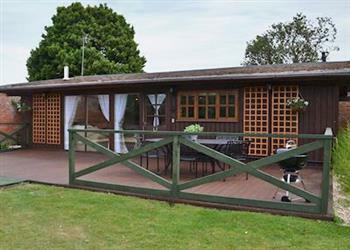 Pampita Lodge in Beverley is set in the grounds of Tickton Hall, next to Beverley Polo Club; this delightful, detached holiday lodge has been superbly renovated and provides a great base from which to explore the area, or to just simply sit back and relax in. There are superb walks straight from the door, and the village pub is just a 1 mile stroll away. Beverley, 4 miles, is well known for its racecourse, minster and many boutiques and excellent coffee shops. The coast at Hornsea can be reached within 10 miles, with traditional amusements and promenade, and a wildlife centre at Hornsea Mere. York, a great place for a day out, is about an hour’s drive, and The Deep at Hull, one of the UK’s biggest aquariums, is about half an hour away. You can even bring your horse with you on holiday, with stabling, grazing and even polo lessons all available by arrangement with the owner. The shop is ¾ mile, with the pub and restaurant ½ mile from Pampita Lodge in Beverley. Welcome to Yorkshire, the home of endless coastline. Tickton Hall is nestled beside Beverley, a historic market town. It is a fantastic location for visiting Yorkshire’s attraction and best kept secrets. From its lively cities, to pretty villages and rolling countryside, Yorkshire has so much to offer. Tickton Hall is a 110-acre private country estate nestled at the end of a tree lined drive just outside the historical market town of Beverley. The estate has wonderful established woodlands and parklands with grazing horses in abundance of which you can see from many of the cottage windows. It is also home to the Beverley Polo Club with two polo pitches, fabulous full size arena and stabling for up to 60 horses. You just might be able to catch a polo match during your stay! You can even bring your horse on holiday with you, subject to availability at our Horse Hotel! These delightful, detached holiday properties (refs UKC458 and W44279 [Tickton Hall Cottage]) provide tastefully furnished bases from which to explore the area, or simple sit back and relax. Breakfast packs and additional cleaning services are also available for guests. There are superb walks straight from the cottage doors. Within the estate you can walk around the picturesque horse exercise course or the cross country course, all within a couple of minutes of the cottage doors. Or if you are looking for a longer hike the estate links to fabulous walks along the river bank for miles. A must during your stay is a short stroll around the polo pitch to the fabulous country pub offering gorgeous local fare with a great garden for children or a sun trap spot by the river bank – no need to drive! Beverley, 4 miles, is well known for its racecourse, minster and many boutiques and excellent coffee shops. The coast at Hornsea can be reached within 10 miles, with traditional amusements and promenade, and a wildlife centre at Hornsea Mere. York, a great place for a day out, is about an hour’s drive, and The Deep at Hull, one of the UK’s biggest aquariums, is about half an hour away. Shop ¾ mile, pub and restaurant ½ mile. Pampita Lodge is all on the ground floor. Living area: With wood burner, 32 Freeview TV, DVD player and CD player. Initial logs for wood burner included. Large lawned garden with decking, patio and garden furniture. Hot tub for 6. Private parking for 4 cars. Both properties: Biomass central heating, electricity, bed linen, towels and Wi-Fi included. Initial logs for wood burner included. Travel cot and highchair available on request. Welcome pack. Stabling and grazing for horses. Fishing on-site (licence required). No smoking. Please note: There is a river in the grounds. Holidays at Pampita Lodge run from Friday to Friday. Pets allowed at Pampita Lodge. For a better idea of where Pampita Lodge is, you can see Pampita Lodge on the map below. Pampita Lodge is in North Humberside; should you be on the lookout for a special offer, you can find all the special offers in North Humberside. It's always worth checking to see what is on offer at the moment. Do you want to holiday near Pampita Lodge (UKC458), you can see other cottages within 25 miles of Pampita Lodge; have a look to find your perfect holiday location.